Carbon reduction is still very much a live issue in 2012 and beyond. This page takes a look at the Kyoto Protocol and how it may help us to reduce emissions worldwide. The Kyoto Protocol deals with a number of greenhouses gases (GHGs). This article on carbon reduction mainly looks at carbon dioxide emissions as the largest and most significant GHG. Please note that this article is only a very broad overview of where we are - and some aspects may become out of date quickly. The Kyoto Protocol - What is it? In 1992 at Rio de Janeiro, the first Earth Summit took place. The United Nations created the Framework Convention on Climate Change (UNFCCC). One of the main aims was to promote carbon reduction, along with the reduction of other greenhouse gases. The counties participating agreed to meet yearly at a conference. The third conference took place in Kyoto, Japan in 1997. The Kyoto Protocol, as the agreement was called, came into effect in February 2005 after Russia ratified the agreement. When Russia ratified the agreement the pre-agreed number of complying counties (55%) was reached, and the Kyoto Protocol rolled into action. Under the Kyoto Protocol, countries are able to either reduce their carbon emissions by the agreed amount, or trade emissions with other countries which have already reduced emissions to below the agreed levels. Their spare emissions can be bought by countries which are finding it difficult to reduce emissions enough. This enables individual countries to buy time while, overall the emission rates are falling as agreed. For example, the UK has signed the Kyoto agreement and ratified it. It is attempting to work with the EU to reduce emissions but in fact, after Tony Blair took office in 1997 emissions increased by 2%. Since 2008 some real decreases have been seen (9.8 per cent lower CO2 emissions for 2009, according to UK government sources), partly owing to the economic downturn which has resulted from the banking crisis. Energy use from nuclear power has increased, so reducing CO2 outputs - but this is one type of energy production which is widely mistrusted by many environmentalists. Now environmentalists are pushing for a Carbon Emissions Act to force industry to comply with the Kyoto Agreement carbon reduction targets. Decreases in carbon emissions have been noted in the EU, a 7.2 percent fall in 2009 - but again, this was largely as a result of the economic downturn. More sustainable decreases are needed which are not dependent upon economic woes. What about countries which haven't signed the Kyoto Agreement? Kyoto non-signers - will they take carbon reduction seriously? As things stand there is still one large industrialised nation which has not signed the Kyoto agreement. The United States of America and Australia were both represented at the Kyoto conference but the USA has not yet ratified the agreement. The Australian government ratified it in 2007. The US government has stated that it believes that ratifying Kyoto would be economically damaging. Things are starting to change now that the Obama administration is addressing the issue - but in 2011, they still have not signed. The US also disagrees with the policy of allowing emerging economies such as China off the hook: China has the greatest carbon emissions - they overtook the US in 2007 - but because it is classed as a developing economy it is not expected to comply with Kyoto at this stage. India and other developing nations are also exempt. There are now 191 countries which have ratified the Kyoto Agreement. Carbon reduction: So what is the US doing? The US government has gathered together a partnership of nations and started its own programme to develop low carbon and no carbon industry. It remains to be seen how effective these programmes will be. From 1990 to 2000 the US economy has become more carbon efficient (more GDP or wealth generation from each unit of carbon) but their actual emissions have risen by 14% - so there has been no carbon reduction at all. Within the US there are individual states and which are creating carbon initiatives, some working with industry to achieve reductions. Nine states and 194 mayors from US towns and cities, have pledged to put legal limits on greenhouse gas emissions. California passed The Global Warming Solutions Act (September 2006) which should bring California (the 12th largest carbon emissions source) into line with Kyoto. Congress is also able to pursue a programme of legislation which, in theory, could enable similar reductions to the Kyoto Protocol. The Australian government believed that ratifying the Kyoto agreement would hurt their countries employment prospects because of fiercer competition from developing nations who do not (yet) have to rein in their carbon emissions. However, the Kyoto Agreement was signed in 2007 by Prime Minister Kevin Rudd. Australia's emissions have been rising faster than most countries; almost twice the global average, according to the Sydney Morning Herald, in the 25 years up to 2007. Now emissions are more under control but real declines are not yet happening. The Australian government is setting some reasonably ambitious targets and has help available for people and industries which are trying to reduce their emissions. In 2012 Australia has reined in it's emissions so that the recent total has been 104% of 1990 levels - the Kyoto agreement stipulated a target of 108%. However, the long term goal of creating a truly low carbon economy is still a long way off. Critics have cast the emissions targets as ' a straw man' in that the emissions totals aimed for were actually in excess of those in 1990 rather than below them! This is of course lower than figures for 1997, the year that the Kyoto protocol took as a starting point, so some small improvements have been made. What about the governments that signed the Kyoto agreement? How are they doing? The European Union members states all ratified the Kyoto Protocol in 2002. The EU agreed to exceed the Kyoto agreement by reducing emissions to levels 8% below those of 1990. Many EU countries are expected to deliver more than that. Germany, Luxembourg and Denmark have all substantial reductions to their carbon emissions to achieve – by 21%, 28% and 21% respectively (figures for 2010). However, other EU nations are struggling to meet their lesser targets. Some increases were allowed for in smaller countries and countries which had only recently joined the European Union. The EU has also established an emissions trading system for six major industries, including energy, cement and steel. There is also a system of fines for countries which fail to meet the Kyoto standards. Things are not perfect however: in summer 2006 Germany, a leading EU member, exempted its coal industry from complying with Kyoto. 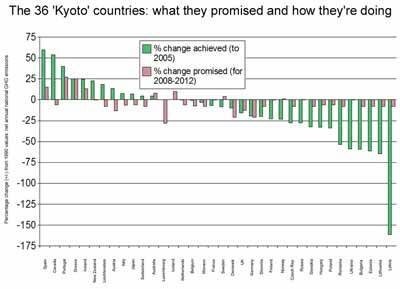 Nevertheless, by 2012 they have reduced emissions by over 22% and have met their Kyoto targets. The Canadian government had been keen to comply with Kyoto, despite protests from some business and industry leaders. Now Canada has rejected the extended Kyoto Protocol deal (along with Japan and Russia). In 2011 Canada withdrew from the Kyoto protocol. The argument was thatthey would be unable to deliver greenhouse gas reductions and would thereby incur large fines. They signed a non binding agreement in 2009 instead. As the third largest emitter of climate change gases, after America and Australia, they have opted for the easier objectives of The Copenhagen Accord. Canada is currently becoming exploiting the tar sands in Alberta which make it one of the world's largest energy producing countries. The effect upon the local environment has been devastating. The Government of Alberta engages in emissions trading to off set the CO2 released. As a cold, physically large country the average use of fossil fuels per person is relatively large. This makes it harder for Canada to comply with Kyoto targets. China as one of the world's heaviest carbon polluters, believes that targets should reflect population. China has relatively low emissions when the counting is done on a per capita basis. As a developing country they are not expected to comply with Kyoto yet. China overtook the US as the world's largest emitter of carbon dioxide in 2007. They are now nudging towards 24% of the world's emissions annually. If you look at the figures over years (cumulative figure from 1850), then they are still way behind the US in total emissions. Russia has had no problem in meeting the Kyoto targets: this was largely because the economy had taken a downturn since the disbanding of the Soviet Union. Now the Russian government does not want to be tied to the extension of the Kyoto agreement, because of the economic costs. Prime Minister Dmitry Medvedev has highlighted the lack of the environmental funding that was promised to Kyoto signatories. Russia will still try to meet their targets but without the legally binding agreement that the Kyoto protocol entails. Russia now has ambitious plans for fossil fuel extraction. They are currently exploring the arctic area for oil and gas deposits, a project which will accelerate global warming and become yet another serious environmental disaster for wildlife and for the planet. See Greenpeace for lots of excellent coverage. Russia and other former members of the Soviet Union may also be in a position to offer carbon trades with other industrialised nations. India as a developing nation does not yet have to comply. Most African nations produce less than 0.1% of the world's carbon emissions. South Africa, however, has a level of emissions like that of a small European state. Switzerland has the world's most carbon efficient economy. I.e. the Swiss generate the most wealth for each unit of carbon used. Sweden is the next best. Many countries worldwide are trying different ways to reduce carbon emissions. There are also schemes to promote "Convergence and Contraction" in the pipeline. This should mean that Kyoto is not seen as make or break; countries which have had unresolved issues with the Kyoto Protocol will be encouraged to participate in their own ways in carbon reduction strategies and eventually dove-tail their activities with those of the Kyoto countries. As the world reels from economic woes, the focus on reducing carbon emissions seems to have slipped from the public agenda. Global emissions are rising faster than ever. The Kyoto Protocol ends its first period in 2012 when a new international framework is supposed to be agreed. Emission reductions are still urgently needed to combat climate change, as identified by the Intergovernmental Panel on Climate Change (IPCC).